U.S. President Barack Obama speaks during a press conference in Kuala Lumpur, Malaysia, Nov. 22, 2015. “We do not succumb to fear,” said Obama. While the terror threat is real, he added, there is a difference between being vigilant and having the kind of fear that causes people to abandon their values. U.S. President Barack Obama delivered a strong message against terrorism Sunday at the closing of the annual meeting of the Association of Southeast Asian Nations (ASEAN) and the adjoining East Asia Summit. On Friday, Islamist militants carried out an attack at a hotel in the Mali capital, Bamako. Earlier this month, the Islamic State militant group claimed responsibility for a string of gun and bomb attacks in Paris that killed 130 people. “Today families in too many nations are grieving the senseless loss of their loved ones in the attacks in France and in Mali,” said the president. 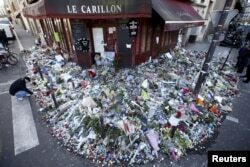 People mourn outside "Le Carillon" restaurant a week after a series of deadly attacks in Paris, Nov. 22, 2015. The U.S.-led 65-nation coalition to counter Islamic State militants “will not relent,” said Obama and added that since the latest terror strikes some countries have stepped up their commitment to combat the extremist group. “I think it is absolutely vital for every country, every leader to send a signal that the viciousness of a handful of killers does not stop the world from doing vital business,” Obama said. The U.S. leader spent much of an hour-long briefing speaking to reporters about the effort to combat terrorism. In recent weeks, there has been an intense debate in the United States and other countries about whether refugees fleeing the violence in Iraq and Syria pose a greater security risk because of the potential that terrorists might try to hide among them. “We will not give in to fear or start turning on each other or treating some people differently because of religion or race or background,” Obama insisted. Before departing Kuala Lumpur, the president also cited progress on the U.S. rebalance to the Asia-Pacific, the centerpiece of the Obama administration’s foreign policy in the region. The White House says during the summit, the U.S. reaffirmed its ties with treaty partners, including Japan, Australia and the Philippines. 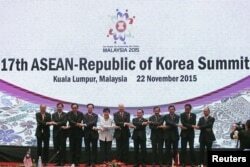 South Korea's President Park Geun-hye (C) poses for a photo with ASEAN leaders during the 17th ASEAN-Republic of Korea Summit at the 27th Association of Southeast Asian Nations (ASEAN) summit in Kuala Lumpur, Malaysia, Nov. 22, 2015. The U.S. unveiled a plan to help Manila modernize and expand its maritime capabilities in the region. The U.S. and ASEAN members also held talks on the South China Sea, where Beijing’s territorial claims have raised tensions with neighboring countries. ASEAN nations agreed to work toward a code of conduct in the region that would include the implementation of international principles, including freedom of navigation, overflight and the peaceful resolution of disputes in the South China Sea. President Obama said he also invited all 10 ASEAN leaders to the United States next year to ensure the U.S. and Asia Pacific nations continue to strengthen ties.